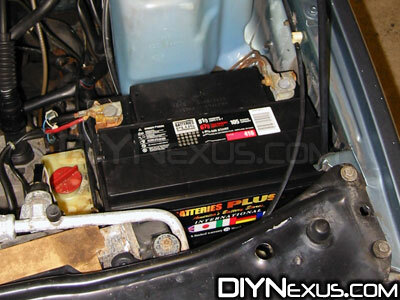 This DIY will explain the procedure for removing the battery on a MKII Golf, Jetta or GTI. Note: You will lose power to the entire car! This means that you’ll lose your radio settings, the clock will go off, the MFA will lose the mileage, MPG, etc. If your radio requires a code to operate be SURE to have it ready before you disconnect the power. 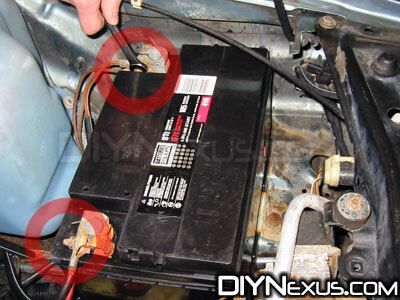 1) Open the hood and locate the battery on the driver’s-side of the engine bay near the front of the car. 2) Using the 10mm wrench, loosen the nuts on the positive and negative terminals. 3) Once loosened, pull the negative terminal straight up off the battery terminal post (sometimes it helps to twist) and place it behind the battery. Repeat with the positive terminal. Thanks to jbx2 from the ‘tex for the safety tip to remove the negative terminal first. This prevents accidental shorting to the chassis when removing the positive terminal. 4) Now we need to locate the battery hold-down clamp bolt. It’s down at the base of the front of the battery. 5) Using the ratchet, extension and socket, remove the bolt and clamp. Note the orientation of the clamp so that you know how to reinstall it later! Often times these are rusty, dirty or corroded. Consider cleaning them with a wire brush and painting them to prevent further deterioration. Also, I always use anti-seize on the threads of this bolt when reinstalling it. 6) Here’s the hardest part. To remove the battery, first you need to slide it towards the front of the car slightly to disengage it from the rear clamp. (You can’t really see the clamp now, but it will become clear after the battery is out) After you’ve slid it forward about 1/2 an inch, you can lift it up and slightly towards the passenger’s side of the car to clear all the obstructions. (If your MKII doesn’t have power steering, it’ll be a lot easier for you!) Once you’ve cleared everything, simply take the battery out. Of course, be careful not to tip the battery too far from level or it may leak. If you’re keeping this battery, I suggest you wash it off with a damp cloth to remove any dirt/acid residue. Be sure to get the bottom as well! 8) If you want to reinstall this battery or a new one, you basically need to reverse these steps. Be careful to put the battery back in, then slide it back about 1/2 an inch, and slide it left to right a little while pushing back. This should get you back in that rear catch. Then reinstall the bracket and bolt. Finally, reinstall the terminals (positive first, then negative) and tighten them.